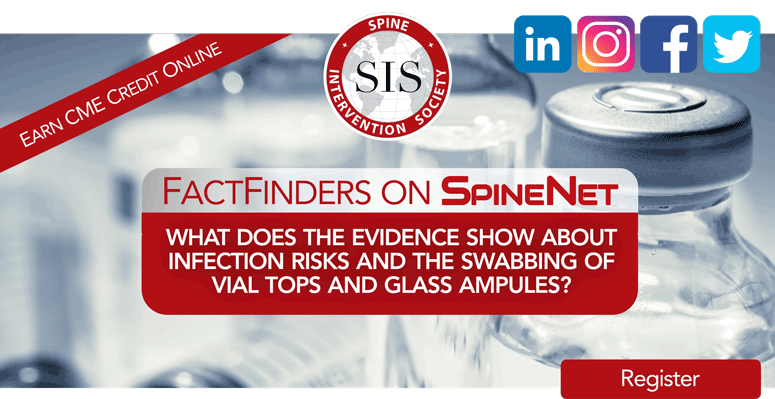 Earn CME credit on the SIS eLearning platform SpineNet for reviewing the FactFinder: Swabbing Vial Tops by Jaymin Patel, MD and Clark C. Smith, MD, MPH on behalf of the Spine Intervention Society’s Patient Safety Committee. SIS FactFinders explore and debunk the myths that surround patient safety issues. Many other FactFinders have been developed by the SIS Patient Safety Committee and are available at no cost (without CME credit) here.